Finally, after a few months, I am finally ready to release it into the wild. 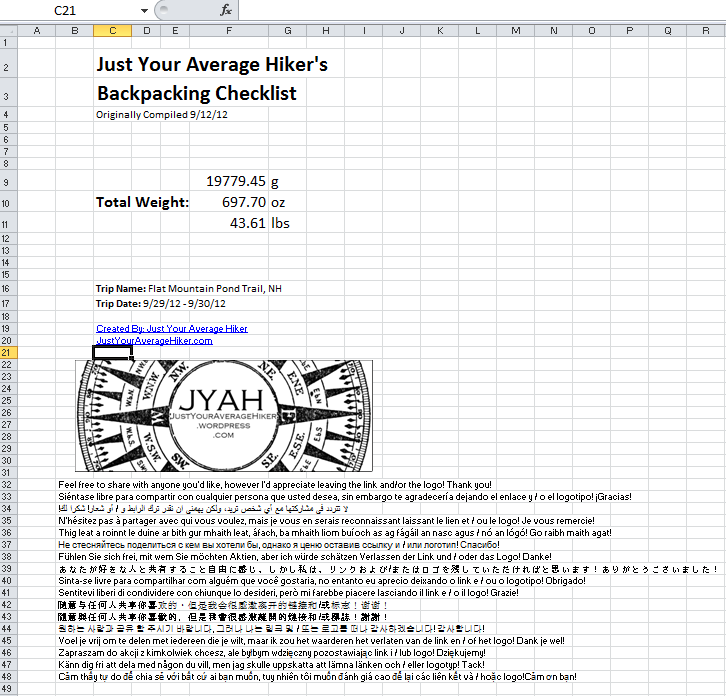 My Excel-based backpacking checklist. I am a technology geek, so, instead of using something simple like a printed notepad or Microsoft Word document, I wanted to use a tool that can help me automatically calculate weights and whatnot on each trip, so I went with Excel, over my old method that was using Microsoft OneNote. As you can see from the screenshot above, it is an example from an actual trip I took back in September 2012, and is loaded with a good selection of my gear. This is here as an example. I have a base copy which I keep in a folder on my computer… C:\TRIPS, for example. For each trip I take, I create a folder with the date, as well as the destination. For the example included, I have the following folder: C:\Trips9.29.12 – NH – Flat Mountain Pond – Backpacking which denotes the date of leave, the state, the location, and the activity. Within this directory, along with a copy of the backpacking checklist, I also include any downloaded trail maps, trip photos, contact information of those on the trip with me, etc. So I can keep it all organized together (see image below). From there, I open the checklist up, set the trip information on the first page, and start checking off items I will be bringing (most of them pre-weighed), as I pack up my things. This is the main/front sheet. DO NOT edit the Total Weight section, this is calculated from all of the other sheets in the workbook. Things for making fire… lighter, tinder, firesteel, etc. X’ed here if this item will not be brought. Used for pre-checking the list before packing. Used in calculating overall weight on the main page. Useful for post-trip notes on what was/wasn’t used. Click here to view and/or download a copy! Please share the checklist with anyone you choose, but please leave a link or the logo within the workbook! This is hosted on Microsoft SkyDrive, so it will automatically open for viewing within your browser if it is supported. This will allow you to see the workbook in a read-only mode. Please send me any feedback as comments to this post! I would love to learn how I could improve this for myself and others who may use it. I will post new blog posts with any updates to this workbook, so we can call it v1.0 for now. The web-based excel application works just like your own client version of excel does, so use the tabs along the bottom to navigate to the different sheets in the workbook. Enjoy the checklist! And please leave feedback! This entry was posted in Backpacking, Camping, Gear, Hiking and tagged Backpacking, Backpacking Checklist, camp, camping, Camping Checklist, Checklist, Excel, gear, Hike, Hiking, Hiking Checklist, Microsoft, UL, Ultralight, Ultralite, Weight. Bookmark the permalink. Love the checklist – thanks for sharing!